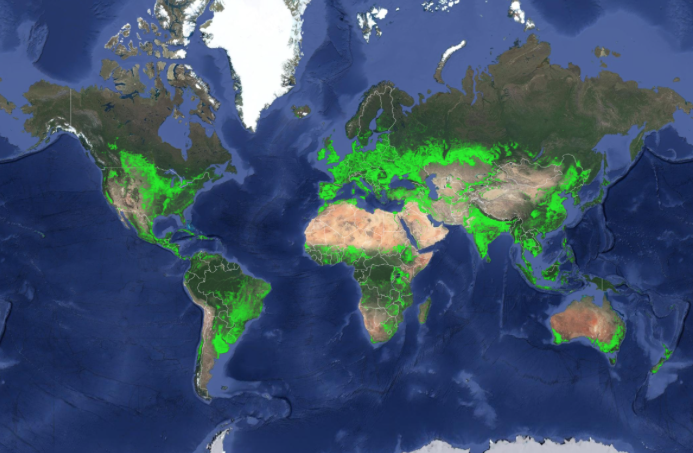 This map shows cropland distribution across the world in a nominal 30-meter resolution. This is the baseline product of the GFSAD30 Project. It took years, but with the aid of Landsat satellite imager, the results are in of which nation has the highest net cropland area. A new map was released today detailing croplands worldwide in the highest resolution yet, helping to ensure global food and water security in a sustainable way. The map establishes that there are 1.87 billion hectares of croplands in the world, which is 15 to 20 percent—or 250 to 350 million hectares (Mha)—higher than former assessments. The change is due to more detailed understanding of large areas that were never mapped before or were inaccurately mapped as non-croplands. Earlier studies showed either China or the United States as having the highest net cropland area, but this study shows that India ranks first, with 179.8 Mha (9.6 percent of the global net cropland area). Second is the United States with 167.8 Mha (8.9 percent), China with 165.2 Mha (8.8 percent) and Russia with 155.8 Mha (8.3 percent). Statistics of every country in the world can be viewed in an interactive map. This map shows U.S. croplands in a nominal 30-meter resolution. South Asia and Europe can be considered agricultural capitals of the world due to the percentage of croplands of the total geographic area. Croplands make up more than 80 percent of Moldova, San Marino and Hungary; between 70 and 80 percent of Denmark, Ukraine, Ireland and Bangladesh; and 60 to 70 percent of the Netherlands, United Kingdom, Spain, Lithuania, Poland, Gaza Strip, Czech Republic, Italy and India. For comparison, the United States and China each have 18 percent croplands. The study was led by the USGS and is part of the Global Food Security-Support Analysis Data @ 30-m (GFSAD30) Project. The map is built primarily from Landsat satellite imagery with 30-meter resolution, which is the highest spatial resolution of any global agricultural dataset. Prasad Thenkabail, USGS research geographer and Principal Investigator for the GFSAD30 Project Team commented that the map clearly shows individual farm fields, big or small, at any location in the world, and given the high resolution of 30 meters and 0.09 hectares per pixel, a big advantage is the ability to see croplands in any country and sub-national regions, including states, provinces, districts, counties and villages. This map shows croplands in Texas in a nominal 30-meter resolution. With the global population nearing the 7.6 billion mark and expected to reach 10 billion by 2050, it is of increasing importance to understand and monitor the state of agriculture across the world in great detail. This new research is useful to international development organizations, farmers, decision makers, scientists and national security professionals. Thenkabail continued saying that this map is a baseline and starting point for higher level assessments, such as identifying which crops are present and where, when they grow, their productivity, if lands are left fallow and whether the water source is irrigated or rain fed. Comparisons can be made between the present and past years as well as between one farm and another. It is invaluable to know the precise location of croplands and their dynamics to lead to informed and productive farm management. The importance of this map and accompanying data have significant food security implications, and it is also critical as a baseline for assessing water security. Nearly 80 percent of all human water use across the world goes towards producing food, and this research provides insight on “crop per drop,” which is an assessment of the amount of crops produced per unit of water. Thenkabail added that the project is a major undertaking for many reasons. One major challenge was obtaining cloud-free images in regions such as the tropics and during rainy seasons. That took multiple years in some areas. This project required the use of satellite-acquired big-data analytics using machine learning algorithms on a cloud computing platform such as the Google Earth Engine. Another important aspect of this project was the rigorous validation of the map, leading to an overall accuracy of 92 percent. Validation was performed by an independent team for 72 zones across the world. The USGS led this project and played an especially valuable role in providing Landsat imagery. The USGS acquires, processes, archives and distributes—freely to anyone in the world—Landsat data from 1972 to the present day. This project uses a one-of-a-kind dataset primarily of Landsat satellite imagery from the year 2015. Remote sensing is critical to achieving a global perspective as well as objective and unbiased information. View how croplands are distributed in each of the countries and download data through the Land Processes Distributed Active Archive Center. The GFSAD30 Project Team’s goal is to map global croplands and their attributes routinely, rapidly, consistently and accurately year after year. The project is a collaborative effort among the USGS, National Aeronautics and Space Administration, Bay Area Environmental Research Institute, University of New Hampshire, California State University Monterey Bay, University of Wisconsin, Northern Arizona University, International Crops Research Institute for the Semi-Arid Tropics, U.S. Department of Agriculture, U.S. Environmental Protection Agency, Environmental Systems Research Institute of Indonesia and Google. The project is funded by NASA’s Making Earth System Data Records for Use in Research Environments Program, with supplemental funding from the USGS.